Experience the underwater world of Key Largo in the Florida Keys aboard the Quicksilver 50ft. sailing catamaran. Quicksilver offers snorkeling trips to Key Largo coral reefs and John Pennekamp State Park in the National Marine Sanctuary. Key Largo sunset weddings can also be arranged on the Quicksilver and you can say your "I do's" as the sun sets.Quicksilver Key Largo snorkeling is a great experience for vacationers to the Florida Keys.The thrill and comfort of catamaran sailing is spectacular aboard Quicksilver, the largest commercial sailboat in Key Largo. Enjoy daily snorkel trips to the beautiful coral reefs of the PENNEKAMP STATE PARK and the National Marine Sanctuary. Swim in the warm, clear waters surrounded by tropical fish and coral. Off and on the boat is easy with our "Stairway to Heaven". Relax in sunny or shady seating areas. Learn to snorkel with our professional instructors and friendly crew. 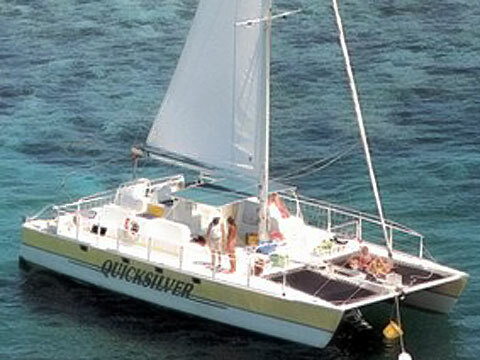 Come snorkeling on the "QUICKSILVER" catamaran in Key Largo in the Florida Keys for a memorable trip to the famous coral reefs of the John Pennekamp State Park and the National Marine Sanctuary! See vibrant tropical fish and coral reefs! Snorkel in the shallow waters where the reef lies close to the surface and all you need is a mask and fins (buoyancy vest provided). An abundant display of coral formations and multitudes of tropical fish await you. The Florida Keys are home to the third largest barrier reef in the world. The living coral reef is also the most diverse marine ecosystem in the world, comprised of hard and soft corals, over 300 varieties of tropical fish, lobsters, sea turtles, conch, eels, sea rays and so much more!